Atletico Madrid President Enrique Cerezo agrees with those fans and pundits who are calling Radamel Falcao the best center forward in the world. 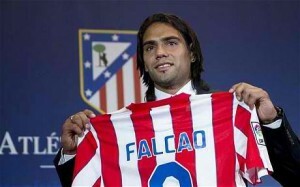 Falcao is having a remarkable season, and is one of the biggest reasons why Atletico are second in La Liga. Lost amongst the noise of Lionel Messi breaking the goal scoring record over the weekend, was the performance of Falcao, who scored five goals in Atleti’s 6-0 thrashing of Deportivo La Coruna at the Vicente Calderon. “Right now he is the best number nine in world football,” Cerezo told journalists. “But he still has a lot of football to play. Falcao has been linked with a move away from Atletico all season, with Chelsea said to be the most likely destination for the striker. Cerezo was asked about the player’s possible exit. Cerezo is pleased with Atleti’s return to form after two consecutive defeats. “Yesterday was a great game, three very important points, and we’ll see what happens on Wednesday [against Getafe]. We want to go far in the Copa del Rey. Atletico head to the Camp Nou this weekend, six points behind Barcelona in the title race. A lot of neutral fans are hoping that Falcao and his Atleti team-mates can pull off the upset win to at least maintain a title race into the new year.